This blog is by Chris Bennett, a 50+ year old who enjoys running, cycling and triathlons, even though he isn’t particularly good at the latter (especially the swimming). A Civil Engineer by training, I work for the World Bank in the transportation sector. This means lots of travel so I get to train in very interesting – and not so interesting – places. Originally Canadian, we lived from 2003-9 in Washington D.C. which is a great city to train in, with many clubs and places to escape the city. If you have to live in a large city in America, this is a hard place to beat. I started triathlons while living in D.C.
From 2010 I’ve been based at the World Bank’s office in Sydney Australia and working in the Pacific Islands. My wife runs the Cat’s Pjamas Bed & Breakfast near Nelson New Zealand at the north end of the South Island. It’s a great place to train and the Endless Pool will hopefully attract some triathletes as guests. I love cycling and my web site www.lpcb.org has my trip journals from cycling San Francisco to Maine, mountain biking the Rocky Mountains from Canada to Mexico, following the Tour de France, and more. It also has all my technical publications and papers if you are a glutton for punishment. 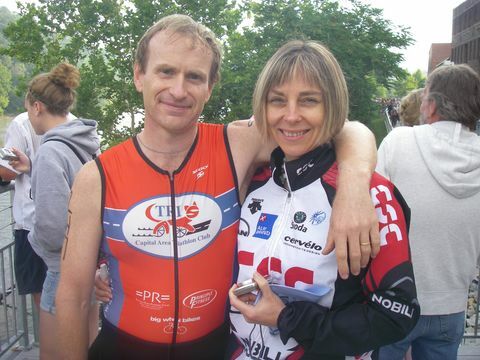 My race – and life – support is through my long-suffering wife Lis Pedersen. Originally Danish, we met in New Zealand where she was my nurse in hospital. I may have got a bad knee, but that was a small price to pay for a wonderful wife. She is a self-appointed ambassador extolling the virtues of New Zealand to anyone who will listen. I am a fellow Kiwi who is a little more than obsessed with the Tour Divide. My partner and I toured the GDMBR two years ago. I am very keen to hear your reports about the event. Cheering for you from Christchurch. It’s a great route and I still fondly recall (well, not really fondly) my tour of it 9 years ago. This year does seem like an ‘epic’ year with all the snow so we will see how it goes! I am on Ironman number 3 of all the continents and admit to being pretty bad as well. Plan a cycle round the world as next challenge in stages. Thanks for your great post on powering your electronics using a dynamo hub. From you great article I got a hold of somebody who really understands USB pass through power banks and they ran some lab type tests. I am a fan of keeping the power bank and USB converter separate so when battery failure eventually occurs it is easy to replace. Take care and good luck on your next adventure. Paul. Nice to hear from you! Hope you are still keeping up with your various adventures as well.